Fig.1 Original 1955 newsletter logo of the Rollin' Rock Club. THE TRUE STORY OF THE FOUNDING OF THE "ROLLIN� ROCK CLUB"
There have been various stories told of the initial founding of the Rollin� Rock Club. The Club had its beginning in 1955 during a meeting of people wanting to continue being a member of the Texas Federation of Mineral Societies, but couldn�t. They were excluded from being members simply because they did not live close enough to belong to a local rock club. I was there and here is the rest of the story. To digress a few years... in 1945 the newly organized State Mineral Society of Texas hosted a gem and mineral show in San Angelo, Texas. J. Frank Woodward, Sr., my Dad, had just recently begun collecting, cutting and selling agate from the Woodward Ranch. He, Mother, my brother, Tommy, and I went to the show. We also took along a few hundred pounds of our agates just to test the selling possibilities and - to see the show. Those days it was still hard to visualize �rocks� as being of value to anyone who might actually pay good money for them. At that time there were only a very few mineral societies or "rock clubs" in all the state: the Texas Mineral Society in Dallas, plus others in San Angelo, San Antonio, and maybe one or two more, possibly in South Texas, East Texas, or in the Panhandle. This meeting in San Angelo was the first official meeting of the State Mineral Society of Texas. It was decided, after accepting the new Constitution and By-laws, electing officers and a board of directors, that there was a need to accept members-at-large as a number of rockhounds lived too far from a local club for affiliation and they did not want to omit anyone. So J. Frank Woodward Sr., was elected as a member-at-large director (and remained so until the title of members-at-large was abolished at the annual meeting in 1955). Back to the San Angelo Show: There were card tables around the perimeter for display of the rocks, minerals, fossils and petrified wood. Also there were rough agates and slabs, and cut and polished stones of various types and kinds displayed by the various people interested in showing others about their lapidary hobby. All typical displays of a rock show. I do not recall any "dealers", as such; however, many items were available for sale. These were mostly loose displays of specimens from the collections and handy works of the lapidary hobbyists. 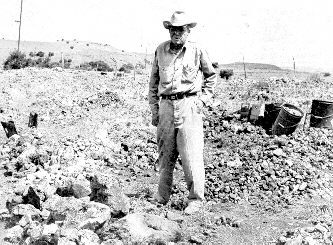 A Mr. Clay Ledbetter had just discovered a deposit of red sandstone-accreted selenite roses in singles and clusters that were quite spectacular. At a general meeting the first evening of the show, Mr. J. J. Brown was President of the new State Mineral Society and Mildred (Mrs. Emil) Spillman was Secretary (she was also Mr. Brown's secretary at his office in Austin). I remember being astoundingly impressed as he introduced each person present by name, where they were from and something interesting about each, even though he had only met a large percent of them that morning. It is interesting to note that in those days there was no need for security guards as most people, especially rockhounds, were considered honest. There were no display cases of any kind and everything was just spread out on the card tables without any worry and NOTHING was taken OR broken. It was very different from the rock shows today. In 1954, my wife Patty and I were living in Wichita Falls, Texas and I was a geologist for Gulf Oil Corporation. Wichita Falls didn�t have a rock club, so I, along with Bryan Lovelace, Joyce Samuels and a few others, got together and organized the "North Texas Gem and Mineral Society". After having helped write the Constitution and By-Laws of the society, and serving as their first president, we then sought affiliation with the Texas Federation of Mineral Societies in 1955. Dad, Mother (Mary Frances), and Ken & Murial Snyder had adjoining booths. After the official meeting, they were be-moaning the fact that they now could not become members of the Federation as neither lived within 200 miles of another affiliated club. (It also appeared they were being specifically excluded.) This immediately brought to my mind the official wording of the constitution, as newly written, and proceeded to say to them, "Why don't you just form your own Members-At-Large club, and then ask for affiliation?" They all agreed and said, �YES! Lets do it". From that small modest beginning, the Rollin� Rock Club �of Texas and any Other State or Country of The World�(O.T.A.A.O.S.O.C.O.T.W.) was formed. Commonly called The Rollin� Rock Club. 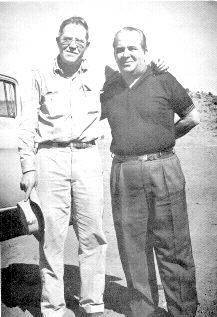 Fig.2 J. Frank Woodward, Sr., from Alpine, Texas and Ken Snyder, from Donna, Texas. The very "first two charter members of the Rollin� Rock Club". This picture was portrayed on the back side of Volume 6, Number 4, December 1961 issue of the Rollin' Rock Club Newsletter where Frank and Ken were wishing all members a Merry Christmas. J. Frank Woodward, Sr., was elected the first President and Mary Frances Woodward was the first Secretary. Ken Snyder was elected the first Supreme Vice-President and this author was the first Treasurer. T.G. (Woody) and Kay Woodward, Murial Snyder and Patricia (Patty) Woodward were also charter members. This author also doubled as the first newspaper editor. The Club was born of necessity, but quickly outgrew the other gem and mineral societies that existed in those days. Fig.3 An original auto decal Rollin� Rock Club logo created by T.G. (Woody) Woodward. Information taken from the above referenced Rollin� Rock Club Newsletter, Inc. (dated December 1961, Vol. 6, No. 4) lists the following officers: Harry J. Bish, President, Bay City, Texas; J. M. �Joe� Hissong, Supreme Vice-President, Rockport, Texas; Mrs. Eve Leland, Treasurer, Round Pond, Maine; Michael F. Kidzus, Secretary, Matawan, New Jersey; Ken Kyte, Editor; and Mrs. Hazel W. Kyte, Co-Editor, from Covington, Louisiana. Mrs. Leland reported there were "approximately" 703 paid-up members for the year 1961. Plus 72 more new members were specifically recognized in the newsletter. 800 copies of the December 1961 edition were printed. The newsletter also mentioned there were only about 35 members in 1956 - one year after the Club was formed. From that humble beginning of less than a dozen charter members in 1955, to over 700 in 1961, to "heaven only knows" how many today (in 2002), it has now grown to a club membership of several thousand members and is active worldwide. By checking the officers� hometown in this 1961 early newsletter one can readily see that the club had already grown to nationwide status. There were also included many, many letters printed from members telling of their rock hunting trips, or just of their having fun sharing rock stories. It is obvious that in 1961 the many members were all still adhering to the initial membership plan that "rockhounds are supposed to have fun". J. Frank Woodward, Sr (1903-1975)(picture ca 1971).